One of my Korean girlfriends tells me Yet Tuh is her favorite place for Korean food, so Billy and I decided to give it a try during a recent date night. The experience was fabulous, but there are a few things you need to know. #1 - Come with a plan. Read dish reviews (Atlanta magazine and AJC's John Kessler both love the place) and figure out what you're interested in eating. The menu does have English captions, but the descriptions aren't helpful and the servers English is only slightly better than my Korean. Yeh Tuh is tucked well into a plaza that looks abandoned. Not visible from the road, you have to drive down into a plaza that seems abandoned even though the "International Plaza" sign shows many stores in Green/White font/background. If you are driving north on Buford Hwy, after you pass Towers, White Windmill and finally Firestone, you will be at the intersection of Buford Hwy and Oakcliff Rd. Take a right onto Oakcliff and the plaza is immediately on your left, so take the first "opening" on your left. Then keep driving down until you can't drive anymore and you will stumble upon two Korean restaurants. Yeh Tuh is the smaller one. 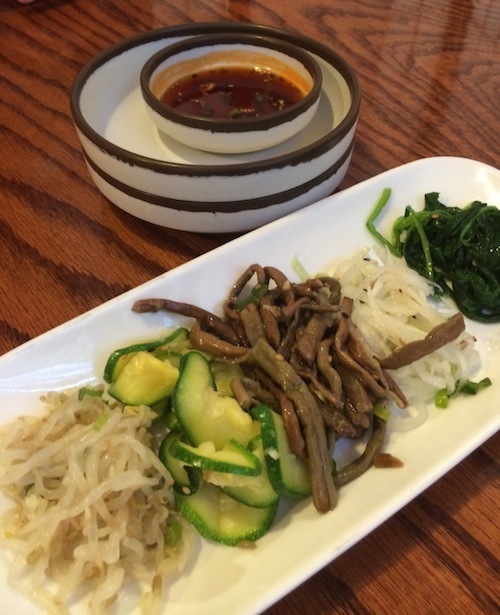 The banchan (those tasty side dishes which are served with Korean meals) lived up to its reputation of being worth the visit alone! There was one dish (top, middle) which was too spicy for me, but I consider that a good sign.The bean pancakes were great -- and came with a dipping sauce that might be crack. Sooooo delish! !For my meal, I ventured into the Korean version of a barley bowl. This dish is called Bori Bap and is served with assorted tasty add ons.The most unusual addition is the warm tofu soup (?- I don't know if soup is the correct word!) 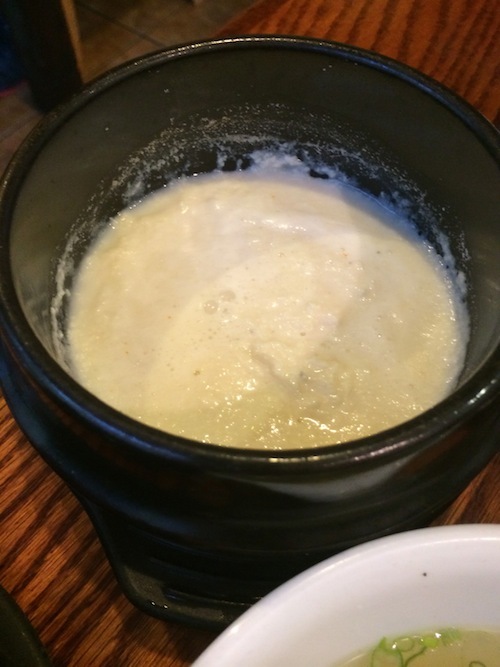 which John Kessler describes as, "tofu dregs that are prized for their health benefits." OK - I'll take his word for it.I also enjoyed the vegetable stew that was added in the mix! 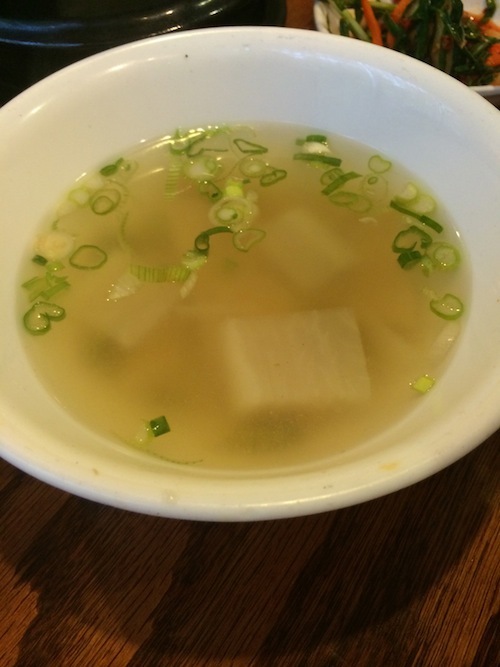 A more recognizable soup of the broth variety was also brought to the table and our waitress indicated I should throw that into the mix as well. However, I mostly sampled from the side. This is a VERY filling meal!In addition to everything above, bori bap comes with toppings which add dimension to the texture and flavor of the dish. 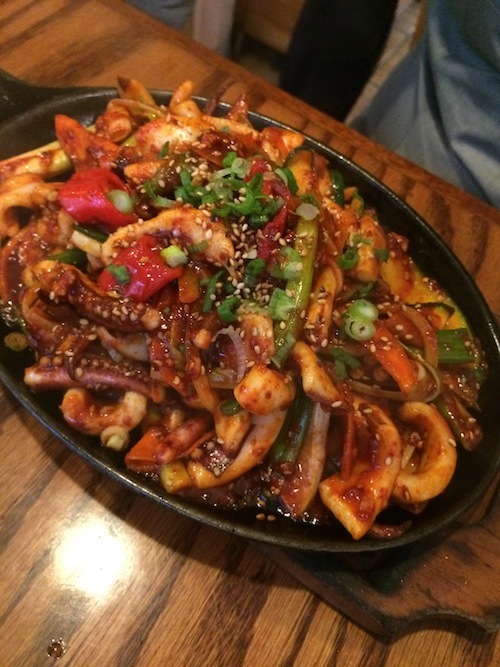 I can see why this is a favorite!Billy opted for the squid stir fry which was five times as tasty as this picture looks!When we arrived, the little place was packed, but we left to an empty room. Was it something we said?If you're game for something unusual, definitely swing through Yet Tuh!